On September 11, 2006, I did my best to ignore the news broadcasts recreating the events of five years ago. The intention was to avoid reminders of things that I had seen, all too well, that day from my office window. I went about my daily affairs. I took care of things, largely in the order in which I found it appealing to so act. In the evening, after long hours of giving counsel to someone, I met up with a friend, JG, and drove across the Navesink River, up the winding, hilly roads of Locust and Middletown, until JG and I reached the Atlantic Highlands, a high bluff on the coast that looks out across a harbor to the New York City skyline. On the hill, optimistically referred to at approximately 400 feet as the Mt. Mitchell Overlook, my friend and I took half an hour shooting photographs at the temporary memorial at Ground Zero, visible from New Jersey. Two shafts of light drifted up, seemingly just west, given our perspective, of the Verrazano Narrows Bridge, until they dissipated high in the atmosphere. A small group of people had gathered at the same location as JG and I, and they watched us taking photographs with as much interest, it seemed, as they were watching the memorial. They asked us about photography and one, in particular, told stories of how he had worked as a glass and steel cleaner in the World Trade Center. There were tourist's scopes at the location, those large metal binoculars that showed a dramatic vista for a small fee, and the glass and steel worker kept advising people to take a look through them at the memorial. "Best quarter I ever spent," he repeated. A shooting star passed, and the fellow became agitated, saying he bet something like that would never happen. "A shooting star," he repeated. "That's once in a lifetime." I remarked, quietly, that the Perseid Meteor Shower came every year during September and October. JG and I largely kept our own counsel, not saying much to the others, although JG later growled that he wished the one guy would shut up. I nodded, and did not admit that I largely wished that all the people at the location would shut up. After wrapping up there, JG and I drove down to the beach just east of the Earle Naval Weapons Station, and set up our equipment again. We calmly went through the method of night photography, setting up our cameras on stable tripods and taking long exposures at different focal lengths of the lights: 10 seconds, 15 seconds, 30 seconds, longer. Today, I went through the New York Times and looked through its Portraits of Grief website. I looked up the page listing a high school classmate, Swede Chevalier. I looked up a lawyer and businessman I could never be. I looked up a man with a chilling prognostication. I looked up a woman I probably would have chased after. I looked up a man that reminded me of my father. I looked up a man who had a temper and an argumentative streak akin to mine. A man whose humor I wished I possessed. A man with similar, cerebral, perhaps "nerdy" interests. After a few moments, I went back and read the page about Swede. I paused for a moment, then closed the windows to all of the websites. They were shooting stars. Once in a lifetime. The truth is, I don't know if there is any great lesson to be learned, other than those political and military lessons, to be learned from 9-11. The obvious ones - that life can be fleeting, that we can lose our loved ones before we have a chance to tell them what they mean in our lives - can be learned after any tragic event: a fatal car crash on the Parkway, a house fire, death after a long illness. But then, it was that the event surprised us - horrified us - with its depiction of not just one death, but so, so many that we realized just how real death was. It could be a lottery, it could take us in one sweeping grasp. It pushed us. Or, at the least, it pushed me. It made me ask serious questions about my life. Was I sleepwalking my way through my decisions? Was I taking that opportunity in each moment to make it something heroic? Was I doing the right thing? Sam Javanrouh, bce christmas lights (Dec. 22, 2004). Javanrouh is one of the bigger photobloggers out there, and that's for a reason: he has a good eye. I enjoy the precision of this shot. There's nearly perfect symmetry going on, which is something that the human eye is drawn toward (in fact, there are those that think that the biological notion of physical attractiveness is based on the symmetry of faces). BCE Christmas Lights also has a silvery tone that I like. I watched (for the fourth or fifth time) my copy of The American Experience: Ansel Adams. Adams was great with black & white film. Perhaps the greatest (well, either him or Stieglitz). Adams could draw a certain shimmering tone that really changed the way we look at the American West. Having seen some of the places he photographed, Adams did a lot to change the way the places actually appeared in his work. Golden mountains take on a white, papery tone. Pale green aspens become tinsel. That tonal change is pretty impressive, as is the tonal qualities of BCE Christmas Lights. There's a gradient to the tone in this work that furthers the sense of order therein. This week's Carnival of the New Jersey Bloggers is up and raring. There's some great shots on it that reference some of my favorite NJ architecture. As always, link early and link often. In Red Bank, the town where I somehow am allowed to run amok, Independence Day is celebrated today, on July 3. All of the locals drag beach chairs or picnic tables to their postage stamp front yards and watch the fireworks while eating potato salad and chatting beneath the oily scent of citronella. It's one of those holidays that also brings down thousands of out-of-towners, those who we on the shore refer to as "Bennies." We're not terribly fond of or nice to bennies, and that's probably unfair, as they bring money and spend it.... only there's a certain class of newly rich bennies that are set on making sure you know that they're gracing you with their money. Often, these bennies drive Hummer 2's and Cadillac Escalades. My brother, a waiter at one of the fifty thousand Italian restaurants in Red Bank, has noticed that bennies are easily identifiable by the fact that, when told that the restaurant is BYOB because it lacks a liquor license, they will ask, indignantly "Why!?" as though it were a personal insult. I complain about the bennies, and I know they'll swarm around my town like pudgy, sunburned locusts today, but they're as much a part of the place as I am. And, well, they're as much a part of the nostalgia I have for Independence Day (along with Christmas and Thanksgiving, my three favorite holidays). Pushing through crowds, a sausage-and-pepper sandwich in a paper napkin, the cordite smell of fireworks, the distant sounds of rock and roll made before I was born. If I drove down to Sandy Hook, paid the five dollars to get into Gateway National Recreation Area, I could peer into the summer haze and see the Statue of Liberty, and know that near there is an island where my family came in order to escape the Nazis and the Soviets. The grandparents bought bad synthetic knit shirts that pulled taut over their bellies - the ones that they developed with pride in this new land of good jobs and police that didn't make people disappear - and their sons met, then exceeded, the grandparents expectations, with one becoming a CEO, another a professor at Princeton, and a third becoming a judge. It was with the grandchildren - my peers - that things got a little crazy, but three generations are sufficient fodder for a little rebellion, and I'm sure my grandfather, had he outlasted his stay in a Stalag for more than six months, would have looked on in amusement. We all grew up with love for that something about this country that we couldn't really put into words, even obliquely. Strange glints were seen in our eyes when we shared barbecue chicken and watery American lagers at summer barbecues, the children playing in a pool in which my uncle had hand-painted a picture of Snoopy surfing. Contented, slack-faced gazes stared down from couches and the plastic seats at Shea Stadium when my father's generation discovered the ultimate in Americana: baseball and a love for the underdog. Eye-clenching ecstasy took my cousin by surprise when he discovered that rock-and-roll really could save his soul. He's a thirty-something father of two now, still rockin' out with the band, a successor in interest to the Ramones and the rest of the sloppy punk scene of 1970s New York City. I lost my breath, then my heart, to the mountains and deserts of Utah, New Mexico, Arizona, Colorado, and Wyoming. I was seduced by the west, by the cowboy, the Navajo and the ghosts of the Anasazi, by the mountain men of the past and the naturalists of the present. So, it's a big day for me. I'm going to head down to the water now, camera strapped around my shoulder and sausage-and-pepper sandwich in hand (albeit briefly) and watch couples with baby carriages and sore shoulders from carrying a toddler on their neck prepare the next generation for its love affair with America. We'll stand together while the toddlers dribble soft serve ice cream on their fathers' heads. I'll watch the next generation slowly catch on to the love affair that has taken three generations of men in my family. Here's to them falling in love too. Picture Envy No. 24 - And Pilate asked "What is truth?" A quiet Memorial Day heads into the homeward stretch for me. I can see from my window the many wreaths placed at the foot of the Red Bank VFW statue, and during my lunchtime walk, saw the black-shrouded visitors at the local 9-11 Memorial. The one that stares out the Manhattan skyline from the banks of the Navesink, the river that cuts through this town that lost more people on that day four years ago than any other place besides New York itself. Sy S., Gas Station, on Altphoto (May 27, 2005). I'm going to take a different tack with Picture Envy this week, if only because I happened upon something that intrigued me and merits discussion on its own. I came across Altphoto (some shots on this site, it should be noted, are not safe for work) via Conscientious, a weblog that discusses photography (and, apparently, puts forth some rather left-leaning views on politics; I can do without the politics, but I like the discussion on photography). Altphoto is one of the websites out there where people can post their photos for comments and rating. I suppose that there are good sites for that sort of thing, and that there is a value to it. One can get a lot of useful information about how one should change shooting, processing or post-processing (i.e., photoshopping). I still am uncomfortable about this sort of thing, though. I can tell when people host my photos from Unbillable Hours on other sites because I can see the bandwidth drain. I've had a few occasions when I've noticed people copying my photos onto other sites. Moleskinerie, for example, has done so on a few occasions, but only to point to me, and I've appreciated the kind words I've received from that site's operator. In the one instance where I've found my photos being "pulled" to another site, draining my bandwidth, I've been less charitable in my response, as I found it more akin to plagiarism in how that (intentionally unnamed) site used my photo. Nonetheless, there are probably many points of merit and denigration that can be made with respect to sites like Altphoto that I don't want to address here. I want to talk about Gas Station, the discussion associated with it, and why there is something about both this photo and the attitude behind it that I dislike. I come to this discussion – and this is relevant, as you will see – as an amateur with respect to post-development manipulation of images with Photoshop. I've learned a few tricks here and there – as can be seen by The Gates # 4, Untitled # 3, and (my favorite) Philosophy is a Walk on a Slippery Rock – but I am not terribly adept at using the application. I trawled through Altphoto, tabbing images I liked when I came across Gas Station. First, I noticed that it reminded me of the work of someone else. I almost felt like I've seen that work before, either in my collection of photos by Walker Evans or in my viewings of Gary Winograd's work. It feels a lot like the famous Life magazine photograph taken by Andreas Feinenger, Route 66, Arizona, 1953. I liked the image, but I was also put off by how similar it was to the works of others. "You've apparently dodged (lightened) around the CAFÉ sign. 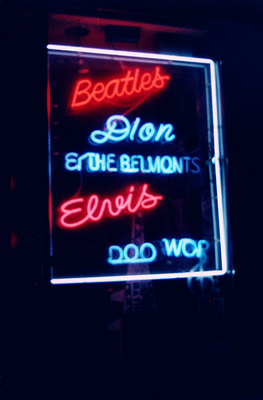 The halo you created around the sign makes the manipulation too obvious and diminishes the otherwise appealing image." I scrawled back up the page and checked out the shot again; sure enough, there was the halo mentioned by Havanai. While Havanai thought that the photographer, Sy S., lightened the sign (which he may have), I believe that the photographer darkened the sky around the foreground of the image. I scrawled back down to the comments. There, Sy S., the photographer responded to Havanai's comment. "[Y]es thats [sic] true – but in my opinion this is what makes it special. [T]he manipulation is only onvious [sic] to people who know how to [manipulate photos, I presume]. [F]or all the others[,] the effect is nice! [M]y opinion … thanx [sic] anyway!" Upon reading that comment, I was angry. It was as though the photographer had said to me "I'm going to mess around with this photo and you won't know because you are dumb." I have to wonder if others, upon seeing that, felt the same way. Looking back at the photo, I believed that I would have eventually noticed the dodging just as I had noticed the manipulation of the color of the sky. What bothers me about this is that I feel, in a sense, that the image is now a lie to me. I cannot go to the place where Gas Station was photographed and see the same thing that the photographer represents as the image that he saw. I think this is because I believe that color photography, much more than black and white photography, is representative of "the truth." When I look at an image that I've taken, like Being There # 5, I know it represents what I saw that day in 2004 on the streets of New York (well, sort of; the image was shot while the camera was on my chest so that it would not be obvious that I was photographing; therefore, the image's perspective is a few feet lower than it would be if shot at my eye level). I have to admit, though, that I've manipulated the colors of things in photos or cropped out things I didn't like. I'm as involved in this misrepresentation as others like Sy S.
So what is it? What bothers me so? I guess it's that I wanted to believe – like others to whom photo manipulation isn't "onvious" – that the image was true. Color photos appear true to people, more so than black and whites (and these are heavily manipulated also; Ansel Adams did a lot to make his images as majestic as they were). Even though both color and black and white photographs are used in journalism, color photos are especially journalistic because they mimic – to some extent – what the eye sees. Perhaps the appropriate response, for photographers, is to make explicit that they manipulate photos. Perhaps they should do nothing of the sort and maintain the mirage of reality in all cases except those with surreal or flawed manipulations. Perhaps the viewer should assume that all images are doctored. This last solution is the most troubling, as it renders impotent the journalistic intent of so many photographers. I don't know what the solution is with respect to photo manipulation. The question is not new; such manipulation was always possible (basically). Manipulation is only relevant to this discussion now because it is so relatively easy with photo editing software in comparison to chemical manipulation in a darkroom. Even the general question about truth with respect to what we see is nothing new, as we can look at Plato and read him asking these same questions. Still, I ask: what do we do about this question of truth in the days of easy photo manipulations? How do we protect the viewers from seeing something like this and responding, as I did, with frustration? Note: This is my first attempt at a project I intend to work on over time, preparing long form interviews with photogbloggers and related subjects. Criticism is welcome, although I would first state that the subjects should be treated with a great deal of courtesy. -Justin Ouellette, Tryptique de la Chaldeenne (2004). I was talking to a sommelier last night over beers (even sommeliers get to enjoy their profession’s equivalent of fast food now and then). He’s a tall, stout Irishman who used to work with me back when I was a park ranger. The sommelier, C., told me that one of his favorite things about wine was learning the story behind a particular vintage. He loved being able to explain the history behind the vintner who made the wine, the ordeals of raising grapes, and his experiences enjoying the wine. That, to me, is one of the best things about photography. We – as photographers – get to tell a story. Art, in photography, is universal because of storytelling. Anyone can tell a story with pictures. Storytelling makes universal any work it touches. Not everyone can take a beautiful photograph, though. Beauty is particular. 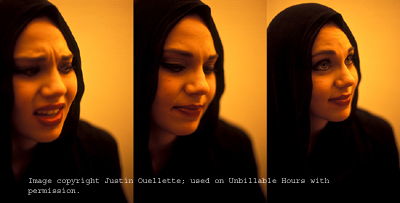 Justin Ouellette’s Tryptique de la Chaldeenne is an example of the universal meeting the particular. It’s a photograph that tells a story, but it is also a beautiful work in its own right. The story is in the suffering. The subject, a young woman named Layla, projects that in her furrowed brow and in her pensive downward glance. Chaldeans are Persian members of the Roman Catholic faith; they are ethnic and religious minorities in homelands of Iran and Iraq, two states not known for their tolerance. The story, for the Chaldeans, is potentially becoming one of hope, and I see a bit of that hope in the third frame of Ouellette’s photograph. With the overthrow of the Hussein regime, there is the potential for increased religious freedom in Layla’s Iraqi homeland (it should be noted that Layla, herself, was apparently a resident of New Jersey during her encounter with Ouellette). Ouellette explained in a January 12, 2005 email that he took this photograph (and others: see image 1, image 2, image 3, image 4) while in Paris, France. Layla was studying at L’Institut Catholique de Paris, a world-respected university. Ouellette knew Layla through living in the same building with her. Perhaps he saw her first while heading down the stairwell to find a favorite café. The subjects we are drawn to are as much reflections of ourselves as they are of others. I emailed Ouellette in mid-January 2005 regarding the Tryptique de la Chaldeenne and asked him how he approached Layla for these photographs. “I… just asked if I could take some pictures of her because I thought she looked interesting and she agreed,” Ouellette responded. I imagined the nervousness of asking someone out on a date to be similar to that of requesting someone to pose. In the kitchen of a small apartment in Paris, one floor below Ouellette’s apartment, Ouellette set up his Nikon F100 camera. He considered the lighting and decided to use Fuji Provia 100F film, which captured the room in a warm, amber tone. Ouellette, Layla, and another American student at L’Institut Catholique chatted and drank Bordeaux as Ouellette shot. I, the viewer, imposed the sorrow and the hope on the images. I gave them feelings that were perhaps more my own than Layla’s (or Ouellette’s). Ouellette explained that Layla was talking to her friend during what he recalled to be the five seconds in which he created the images making up the Tryptique de la Chaldeenne. It is a viewer’s prerogative to project, I suppose. Ouellette shot for two hours. Then, he packed up his gear. He returned to America. After developing his shots, he repeatedly tried to reach Layla by the email address she gave him. He received no reply. Photographs are permanent reminders of the fleeting. When a blogger adds new material, it's called a post. And good blogging demands frequent posting. Biz Stone, 30, Blogger senior specialist at Google (www.bizstone.com), recommends you "post at least as much as you eat." That's "three times a day [with] some snacks," he says. But that requires a lot of time. So perhaps more important is to make your posts worth people's while. Jason Novak, 33, who's hosted the Washington entertainment guide LifeInTheDistrict.com since 2001, says that "what brings [readers] back is that every time . . . there's something good." And "good" extends beyond volume, which means you'll want to avoid the dreaded "blogorrhea" -- aka incessant prattle about your jerk boss or second-rate love life. Mike Peed, How to Start a Winning Blog, Washington Post (Dec. 12, 2004). There is a tendency in the blogging world toward solipsism. Self-referential blogging – the act of writing about the act of writing[i] – is the most painfully patronizing act I can consider, outside of the act of producing reality television shows. Still, indulge me this act of solipsism as I take on Peed's piece about blogging. Peed quotes Biz Stone, a blogger for Google, who advises bloggers to write at least three times a day, with "snacks" to break up those monotonous … hour-long stretches that lack new content. This begs a question: do you people have jobs? 1. Don't blog at work. 2. Don't blog about work. Other than that, it's pandemonium. There are good qualities, mind you, to some of this solipsistic blogging. Recently, Hon. Richard A. Posner, U.S.C.J. (7th Cir. ), the noted Law and Economics scholar, began a blog with Nobel Prize-winning economist Gary Becker. Posner wrote about blogging in a fashion that may have given the medium the imprimatur it needs to be respected for academic writing. Hon. Richard A. Posner, Introduction to the Becker-Posner Blog, The Becker-Posner Blog (Dec. 5, 2004). Posner accurately notes the benefits of blogging: it is a mechanism for the instantaneous pooling of ideas and opinions, as well as the correction, refinement, and amplification thereof. Other than that, we are talking about details. There is no need to consider Peed's rules for getting "x" unique visitors per day. Frankly, if we are blogging for personal, non-academic reasons, that – how to get many viewers - is the single worst consideration to have. It's narcissism. It's saying "regardless of how or what I want to write, I need to make my audience happy. I crave their approval." Reading Peed's piece made me want to say "to hell with it. I gave up writing on my blog for a reason. I ought to just go and develop my photos and ignore this." [i] This, I have noticed, is something for which Annie Dillard should be condemned as well. [ii] See Radiohead, Fitter Happier, OK Computer (1997).